In applications such as sports fields, playgrounds and cattle mats granulate of old tires is used. Rubber granulate is used as infill in artificial grass surfaces used for football, hockey, tennis, rugby, baseball and on driving ranges. However players of other sports also benefit from rubber’s properties. Rubber has exceptional properties for use as flooring in fitness areas, ballet and dance studios, sports halls and gyms. The floors have excellent properties to break falls and absorb vibrations from, for example, power plates and weights. 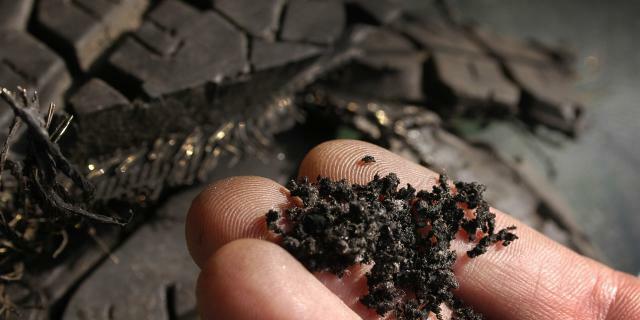 On athletics courts and hard court tennis courts, rubber is often mixed with polyurethane. As a result, these sports arenas also offer good elasticity. Playgrounds are required to meet stringent requirements and safety is at the forefront. When children are playing, they sometimes fall over. A playground with a rubber granulate subfloor reduces the potentially serious consequences of a fall. Rubber granulate safety tiles also ensure children’s safety in playgrounds. Playground equipment can also be made from rubber granulate. Using rubber granulate derived from end of life tyres not only makes playgrounds that bit safer, it also makes them more sustainable! Rubber granulate is also on the increase in animal husbandry where rubber is being processed into cattle matting/stable matting. The rubber matting gives cattle a comfortable bed and promotes cattle welfare. The rubber has a damping effect, is soft and ensures the matting has a long lifespan. Cattle matting made from rubber granulate is a great alternative to standard mattresses.